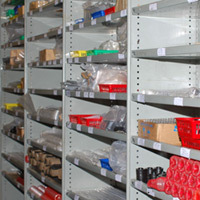 Fisadco initially set up their Kanban system in 2006 following Daren’s visit to the far east and whilst its been expensive, it has paid dividends as we now have a number of signed agreements with our customers, where components and sub-assemblies are carried in our own stores for their “call off” thus virtually eliminating lead times. By coming to a “rolling agreement” our customers now have the confidence that upon sending us an e-mailed order, their parts will be despatched the same day. For us, it helps our forward planning to know six or nine months hence what parts we will be making and perhaps more importantly the type of new equipment we need to invest in to help increase our efficiencies.